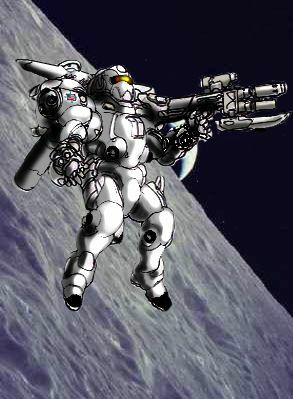 When the United States Space Force was formed, the leaders realized that the troops would need a high mobility power armor for assaults on moon or planetoid bases and internal combat in space stations or space ships. This meant that they needed a fast and non bulky power armor. Various power armor designs were studied including the SAMAS that was just entering service with the army and the Marine Semper Fi power armor. After a large amount of costly research, the United States came up with a completely new power armor that cost three times the amount that a SAMAS would and the project was rejected by the US Congress. The Congress then directed the Air Force to complete a less expensive power armor. The final results was the USA-PA-8 Space SAMAS. The Space SAMAS looks much like a standard SAMAS without the wings or intakes and no flat surfaces. In space, the wings are useless and in combat within space stations the wings would actually be a detriment because the wings would be too wide for the corridors. The engines are a thruster design so intakes are not needed . While the engines are powerful enough for some limited flight ability even in an atmosphere, the engines are far more efficient in space than in an atmosphere. The engine designs come from the canceled space power armors engines and the exhausts are slightly larger than those carried on a standard atmospheric SAMAS. Also attached to the either side of the thruster pack are two fuel tanks. The power armor also has small clusters of navigation thrusters of the main thruster pack, on the feet, on the front of the armor, and on the sides of the knees. This duplication is so that if the flight pack is destroyed, the Space SAMAS can still maneuver. The electronic systems are very similar to those on a standard SAMAS and it is easy for a pilot to learn piloting of the Space SAMAS (In game terms, they use the same piloting and combat skills). The only major internal change is that the space SAMAS has an extended life support system and the radar and communications ranges have been extended. This life support was extended because it may be expected for the power armor to operate for extended periods and the armor cannot get oxygen from the air. The Armor has a special recycling system that allows the power armor to operate for up to 48 hours before needing a recharge. Coupled with this is a nutrient paste dispenser, four gallons of water, and a waste recycling system. The suits thermal insulation is increased and the suit can withstand up to 600 degrees centigrade. The radar system is extended in range when compared to radar systems on Rifts Earth and the power armor has a long range laser communication system. Te armor has lights added in the chest for work when neccesary. For weapon systems, the designers were very conservative and used already designed systems. The power armor carries either that M-105 MWAS that is virtually identical to the M-90 from the Semper Fi power armor or the USA-M31 Rail gun from the standard SAMAS. The power armor also has two mini missile launchers in the left forearm. Both forearms also have a grapple system that launches a grappling hook and cable. These are small and difficult targets to strike, requiring the attacker to make a “called shot,”, but even then the attacker is -4 to strike. Running: 60 mph (712.6 km) maximum. Note that the act of running does tire out its operator, but at 10% of the usual fatigue rate. Leaping, in an Atmosphere: The powerful robot legs can leap up to 20 feet (6 m) high or across unassisted by the thrusters. A jet thruster assisted leap can propel the unit up to 100 feet (30.5 m) high and 200 feet (61 m) across without actually attaining flight. Flying, in an Atmosphere: The rocket propulsion system enables the Space SAMAS to hover stationary in mid-air or fly. Maximum flying speed is 180 mph (290 km), but cruising speed is considered to be 100 mph (161 km). Maximum altitude is 6000 feet (305 meters). Flying, Space: The power armor does not have an effective top speed but is limited by acceleration. The power armor can reach a top acceleration of 0.6 G.
Maximum Effective Range: Conditionally unlimited, while the fusion reactor gives power for two decades of service, when the power armor is using thrusters, it is limited by the power armor reaction mass. The reaction mass consists of mainly Deuterium (Hydrogen 2) and Helium 3. The power armor can be refueled at ground based facilities, space stations, and star ships as long as they have the refueling equipment. The tanks are on either side of the thrusters and can be replaced in two minutes each. The power armor carries 4 hours of reaction mass for travel at 0.6 G of acceleration. If the power armor uses more than half of its reaction mass when accelerating, the power armor will be unable to decelerate fully and the power armor will normally only use a third or less of its fuel on accelerating so it does not run into a problem. If the power armor runs out of fuel then it must be recovered by another vehicle traveling faster or be lost. The power armor can operate with engines on standby to increase engines range. Underwater Capabilities: Although not designed for underwater use, it can walk along the bottom of the sea at about 25% of its normal running speed. Using the jet thrusters, the SAMAS can travel on the surface of water at 50 mph (80 km/42.5 knots), underwater at 40 mph (64 km/34 knots) or fly above the water surface an normal speeds. Maximum Ocean Depth: 2000 feet (610 m). Black Market Cost: If found it would probably be worth 3.5 million for a new, undamaged, and fully operation power armor complete with missiles and all weapons. The power armor would be worth about 2.5 million IOU in the orbital community. Hand held Weapons: To increase the flexibility of the armor, the armor was fitted to carry eiether the M-105 MWAS or the USA-M31 rail gun. The M-105 MWAS is used on 80% of all Space SAMAS. M-105 Multi-Weapon Assault System (MWAS): This cannon, which is virtually identical to the cannon used on the APA-15 Amphibious Assault Power was selected in place of the original rail gun because the Ion cannon has a much lower recoil which is important in zero gravity environments and the Ion pulse gun has an unlimited payload as well. The weapon's only difference from the M-90 MWAS is that the weapon has an integral laser targeting system. The mini-missile launcher is often used to quickly open hatches or blow holes through bulkheads and normally carries Plasma or Armor Piercing rounds. Missile are assumed to accelerate at 2 times normal mach speed in Gs greater than the starships speed when used in space. Missiles can be launched at non moving targets beyond the powered range of the missiles to hit targets without the chance of the launching ship being hit by missiles itself but penalties exist when launching missiles beyond normal missile range. Maximum Effective Range: 4,000 feet (1,200 m) in an earthlike atmosphere and 32,000 feet (9,600 meters) in space for the Ion pulse Gun. Missiles vary by missile type but missiles ranges are eight times normal in space (See revised bomb and missile tables for details.) Vibro-Bayonet is used for close combat only. Payload: Effectively Unlimited for Ion pulse cannon (Draws power off the armor). The Mini-missile launcher has a payload of 12 mini-missiles in a drum magazine. USA-M31 Rail Gun: This is the same rail gun design that was original rail gun on the atmospheric SAMAS design. The power armor computer has special software that fires the main thrusters just as the cannon is fired to compensate for the cannons recoil. Weight: 110 lbs (50 kg) for the Rail gun and 190 lbs (86.2 kg) for the ammo drum. Mega-Damage: a burst of 40 rounds does 1D6x10, a single round does 1D4+1. Payload: 2000 round drum for 50 bursts. A second drum can be hooked to the undercarriage of the rocket jets, but first the used drum must be manually removed by another SAMAS or character with a strength of 26 or higher before it can be replaced with the new one. Reloading a drum will take about five minutes for those not trained, but a mere one minute by somebody trained in the use of SAMAS power armor. USA M-17 Forearm Mini-Missile System: Like the standard SAMAS design, the Space version comes with two single shot mini missile launchers on the left forearm. Missile are assumed to accelerate at 2 times normal mach speed in Gs greater than the power armors speed when used in space. Missiles can be launched at non moving targets beyond the powered range of the missiles to hit targets without the chance of the launching ship being hit by missiles itself but penalties exist when launching missiles beyond normal missile range. Forearm Grapples (2): the power armor has two grapples that are used for docking with vehicles that do not have landing bays and to grab items. The grapples top is specially designed so it also acts as a powerful electromagnet. The Grapple is fired at a target and can either use the claw to grab the target or the electromagnetic to attract the object if it is metal. The grapple has a breaking strain of 10 tons and the electromagnetic on each can support up to 1 ton of strain. Energy Rifles & Other Rail Guns: The Space SAMAS can make use of any other hand held weapon including rail guns, energy rifles, energy pistols, and vibro-blades. Hand to Hand combat: See the Rifts source book for more details. Extended Life Support: Unlike most power armors, the Space SAMAS has an air recycling system. This allow the power armor to operate for up to 48 hours before needing to be recharged. While it is not recommended for power armor crews to operate for longer extended periods in the armor, the power armor also has an external oxygen refill nozzle. The Space SAMAS also has a nutrient paste dispenser with enough paste for seven days, has four gallons of water, and has a waste recycling system The suit can also withstand up to plus 600 degrees centigrade and minus 270 degrees centigrade. The suit also has improved radiation protection and polarization. Extended Range Radar: The Space SAMAS has a extended range radar system that has a range of 30 miles (48 km) in an atmosphere and 3,000 miles (4,800 km) in space. The radar system can track up to 48 targets simultaneously. Laser Communication System: The Space SAMAS has a special extended range radio and laser communication system. The radio system has a range of 500 miles (800 km) in an atmosphere and 50,000 miles (80,000 km) in space. The laser communication system is directional and has a range 1,000 miles (1,600 km) in an atmosphere and 100,000 miles (160,000 km) in space. Magnetic Boots: On both feet of the power armor are powerful electromagnetic so the power armor can attach to ships and space stations. Each Electromagnetic is capable of withstanding a strain of 4 tons. +2 to Dodge in space. -2 to Dodge in an atmosphere. Copyright © 1998 & 2006, Kitsune. All rights reserved.